Where to Buy Black Onyx Lake Pond Colorant, Black Onyx WSP Lake Pond Colorant - 4 x 1 Pack - $87.95 for Sale with Fast Free Shipping! 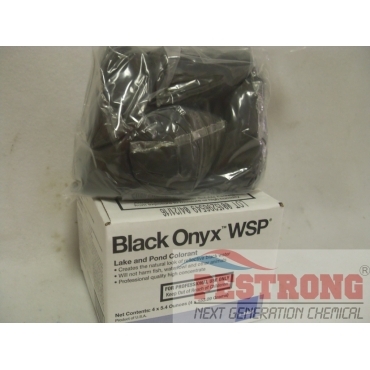 Black Onyx WSP Lake Pond Colorant - 4 x 1 Pack is a highly concentrated, pre-measured, dry formula that disperses evenly as it dissolves in the water body. Black Onyx WSP Lake Pond Colorant - 4 x 1 Pack is a highly concentrated, pre-measured, dry formula that disperses evenly as it dissolves in the water body. It creates a dark, reflective look in decorative lakes and ponds for a stunning appearance. This is 4 x 1 WSP PACK. 1 WSP Pack is almost 5.4 oz. Good stuff, easy to use and it gave beautiful color to my pond, now my pond looks like one of those places on the magazine, just be careful when you use them, you don't want the powders to go anywhere that's not your water.